Dodging an earth quake, missing two plane crashes, a bout of altitude sickness plus trekking to Mt Everest Base Camp and summiting a 5645 m peak. 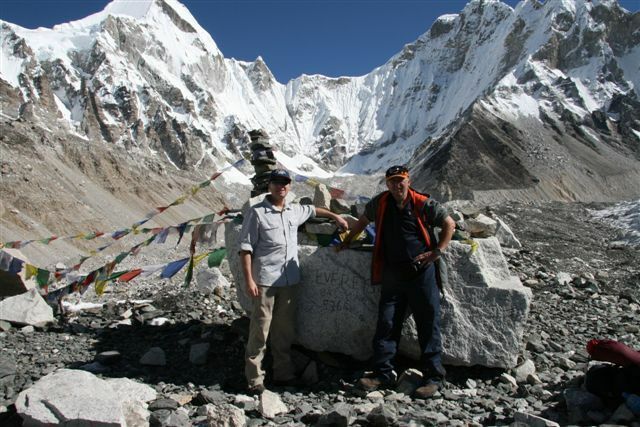 We definitely needed a holiday after the RMC expedition to Nepal in Sept / Oct 2011. Arriving in Kathmandu to find there had been an earthquake a few hours earlier pretty much set the scene for the next 3 weeks. Of course the next day when visiting temples, which is pretty much the only thing to do in Kathmandu, and learning a scenic tourist flight along the Himalayas had crashed killing all on board there was only one thing to do. Book ourselves on the same flight when we got back. After all what are the chances of two crashes on the same flight in 3 weeks. Trekking the Himalayas from the Nepalese side starts with a light aircraft flight from Kathmandu into Lukla airport 2804 m, rated the most dangerous in the world and built on the side of a mountain. From there it is a 2 day trek to Namche Bazaar which is the main trading village with Tibet. The route to Namche follows the river which provides a constant roar with the rumbling sound pounding through the walls of the lodges. Early on the first day a number of homes and a bridge had been taken out by a landslide, triggered by the earthquake from a few days before, which meant we had to detour and make our own path. But this was nothing compared to Namche hill, which was our second day in the mountains. 600 m doesn’t sound like much but when it is all up hill at over 3400 m altitude it equals 4 hours of pain. They say if you make Namche then you should be good for the rest of the way to Base Camp (they don’t mention Tengboche or Kalapathar which are still to come). From Namche we then trek towards Tibet and Thamay to acclimatise before making our way back through Kumjung 3800 m and on to Dingbuche 4350 m with the climb over Tengboche in-between (Namche hill suddenly wasn’t so bad). Over 3000 m is where you start to feel the air thin and it gets harder to catch your breath, your quads burn after only a few steps and a dull headache. There are constant warnings about fluid intake and watching out for altitude sickness (severe headache, staggering, mood changes or vomiting) with the only remedy to “descend descend descend”. From Dingbuche we push on to Gorak Shep 5170 m from where, having taken 13 days to get there, we will summit Kalapathar and then Everest Base Camp the next day. After the summit it is back to Gorak Shep and the onset of Mathew’s altitude sickness. 1AM and he is on Diamox, Mersyndol and the Sherpa’s, under Mr Macarthur’s constant watch, administering oxygen. 2AM and if he gets any worse we will have to descend at least 300 m which will mean a stumbling 3 hour trek in the dark by the light of head torches. Next day dawns and with Mathew recovered we set off for Everest base Camp 5364 m. The terrain since Lobuje is no longer green and lush but is now a moonscape of rubble, moraines and few paths. Our goal consists of a large boulder with the words “EVERSEST BASE CAMP 5364m” etched into it and the obligatory photo shoot (the actual camp itself requires climbers permits) along with mobile phone calls to relatives and friends (yes there is mobile coverage at the top of the world, unlike in Kathmandu). 13 days to get to Everest Base Camp but only 4 long hard days to get back to Lukla and the thicker air. Definition of being tired – you are told there has been a plane crash, just a small one, but you finish lunch before going to check it out. Looking down the runway, which we had landed on 17 days before, there is a cargo plane which had blown a tyre and skidded off the runway and gone through a ditch and a fence. First off are the cartons of San Miguel beer, then the wait for the insurance assessors to helicopter in, followed by draining fuel into plastic buckets and finally a crowd of porters who climb like ants under the plane and carry it up the runway (Air Crash Investigations Nepal style). We fly out first thing the next morning, take the scenic flight which had crashed 3 weeks earlier and stops in Kathmandu and Hong Kong then home.